Breaking the Blockade » The Shadow Archive - Analyzing and Creating some of Fantasy Flight Games' Living Card Games. Focuses on Star Wars, Lord of the Rings, and Call of Cthulhu/Arkham Horror. Looking back at the last year of releases, one faction stands far above the rest. Since Behind the Black Sun arrived last September, the Scum faction has gotten a new tournament staple in every pack. From the turbo resourcing in The Spice Trade, to dangerous mains like Bane Malar, and punishing events like Captured and Vicious Counterattack, Scum players have a wealth of powerful options. Upcoming spoilers show that streak will continue for a while longer. But while times are good for fans of green cards, what are light side deckbuilders to do? Today we will be looking at 3 older pods that could find new use in today’s meta. This is not meant to be a complete list of good anti-Scum pods – several good ones are already seeing plenty of play, such as Mysteries of the Rim, Flight of the Crow, and Planning the Rescue. On the other hand, these pods discussed below have fallen out of play despite their utility. This pod was such an essential part of light side decks for the first two cycles it seems crazy it ever dropped off the radar. Once Qu Rahn came along, however, Secret began to see less and less play since he was so useful against the dominant Sith decks of the time. Why is it good? – When Lightsaber Deflection is the worst card in a pod, you know it’s a good one. The objective – Compared to when it first saw play, there are a lot more objectives that need protection on the light side these days. Keeping damage off A Hero’s Duty can swing a game, or allowing your Spark of Rebellion to stay alive for another turn in search of more units. C-3PO – The real attraction of this pod, this is one of the only ways in the game to stop cards like Captured or Threat Removal from ruining your board. Once he’s in the discard pile, C-3PO also becomes a prime target for recycling by Balance Obi-Wan or Hyperspace Marauder. He even takes the focus tokens from Dark Lord of the Sith like a champ. Guardian of Peace – The Scum faction may not have many units with targeted strike, but they do have plenty of ways to deal damage outside the combat phase. Lady Valerian and Hunters for Hire can deal plenty of chip damage to your units, and the Guardians are a great way to make sure that damage stays off your mains. Twist of Fate – the best fate card, forever. Pretty much the only way you don’t lose an edge battle to The Prince’s Scheme. Why isn’t it good? The main reason to avoid this pod is if you are expecting to play against a lot of Sith or Navy, rather than Scum. Specifically, the Dark Counsel pod – while it was printed to knock Qu Rahn down a peg, the various way it can shut down the Guardians hurt this pod quite a bit. Thanks to C-3PO and the Twist at least this pod can never be useless. Against Navy, this pod’s defensive orientation works very poorly against Enforced Loyalty. The synergy between the Guardians and the Spark of Rebellion objective is strong. Add in two pods of Lost Masters and you end up with the closest thing Jedi will ever get to a swarm deck. This deck can go very wide while still fielding strong mains like Yoda, T’ra Saa and the Moldy Crow. While this pod never saw nearly as much play as Secret, it still was a vital part of the Trench Run deck that Mick Cipra used to dominate the 2014 World Championship. Outside of that deck, Ferrus and his trusty Asteroid Base have never found much of a home. Compared to Secret, the event cancel in this pod is a lot less reliable – but having access to it at all is a big step up from most light side deck, which have none. Additionally, the focus of the whole pod on shield synergies mean it plays with very different archetypes. Ferrus Olin – Unlike C-3PO, who has to die for his effect, Ferrus can stick around! He also hits a lot harder too. On the downside, the lack of elite hurts him along with the fact that it’s hard to use his ability before the combat phase. Asteroid Base – While this card has been nerfed by errata, being limited to once a turn only brings it down to the level of Resupply Depot – in other words, still extremely strong. Being able to hand out free icons makes combat decisions a nightmare for your opponent. Force Barrier – Though expensive, few cards can let you break through a strong defense like this one, and this is just when you use it on its own. Combined with the shield-friendly cards in this and other pods, it can be game winning. ET-74 Communications Droid – Unless you are going all in on shield shenanigans, this icon-less chud is seriously unimpressive. ET-74 Communications Droid – Two of them?! This is worse than the Moldy Crow and its Ruusan Colonists. At least they have a unit damage. More seriously, the quality of these droids is a big drag on the pod, and all but requires you to play other pods that care about shields. If you are willing to play those pods, Deep Commitment is a powerful set with lots of combo potential. Unlike Secret, Ferrus is useful against any Dark Side deck thanks to his icon spread and the power of the Asteroid Base. The new version of Chewbacca released in Imperial Entanglements has never really gotten his chance to be a star. It may well be here, with his set, Ferrus and Preparations for Battle all being powered off of shield tokens. Wookiee’s Journey is here to round out the Wookiee cards in Chewie’s pod. This deck should be able to attack with mains protected by plenty of shields, while keeping the opposing player off balance with the threat of cards like Leia’s Command. If the rise of the Scum faction can bring back any light side pod, it should be this one. Despite the immense utility of this pod, Lando has never been a big tournament star. In his own box set he was overshadowed by the power of the Millenium Falcon and the Sleuth Scouts, and the next cycle brough such powerful Jedi and Smuggler cards that the meta moved on before Lando had his chance to shine. The objective – Event cancel returns again, this time in objective form. Damage is a heavy cost to pay, but in exchange you get a card much less vulnerable to removal than the unit based cancel of C-3PO and Ferrus. Having Trust Me in your opening flop allows you to play units with confidence they will stick around, and the threat of its activation can cause your opponent to play their events completely differently. Lando Calrissian – This card would be a lot better with one more health, or one more combat icon, but the power of his ability cannot be underestimated. Being able to push tactics heavy units like Emperor Palpatine and Prince Xizor out of combat during a critical engagement allows you to guarantee success – even allowing you to ignore the edge battle in some cases. Combine with targeted strike units like Han Solo to destroy your opponent’s mains. Saboteur – Every dark side faction has its own powerful enhancements these days, ranging from 2-cost resources to lightsabers. The Scum faction has several great targets for Saboteur- Jabba’s Palace, Fortified Holding Cells, Abandoned Hideout, to name a few – and the light side has very few other cards capable of removing them. 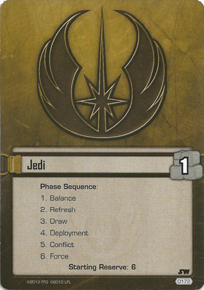 Cloud City Casino, Target of Opportunity – Nothing new here, just important staples in a pod that is already filled with useful cards. When so many smuggler pods have a bizarre lack of resources, decent edge cards, or both, you have to appreciate these when you can get them. Why isn’t it good? – Once every 10 games you might use Sabotage to nab a Darth Vader, Star Destroyer, or other big unit, but the cost of losing an objective is too steep. It’s edge fodder, and not even very good at that with one pip. A bigger weakness is probably that Lando is slightly overcosted for his stats. All in all, this pod is incredibly versatile – able to answer events, units, and enhancements without clogging your deck with cards that are too narrow for use. Lando, Saboteur and the objective will always have useful targets against every dark side faction. 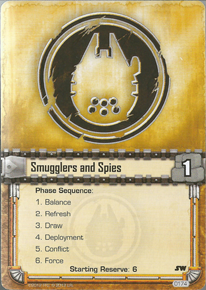 This is a smuggler decklist that should have a fighting chance against any dark side list. Starting from the base of two Millenium Falcons and two Landos, this deck has an excellent base of units with 2 different versions of Han Solo and Chewbacca, along with Wookie Warriors and Hired Hands. There is no end to the tricks this deck can pull out either, from Echo Caverns, to Bamboozle, to Let the Wookie Win. Going into combat against this deck when it has 1-2 resources open should be a complete nightmare. Wrapping Up – Hopefully, this article was able to provide you with a few ideas for building light side decks going forward. In the current meta it can sometimes seem like every dark side deck is playable while the light side has it tough. Digging deep into our binders to find cards we haven’t played in a while could be the way for us to have more deck variety and attack dark side decks in ways that they are not expecting. Thanks for reading, and let me know what older pods you are finding useful these days!